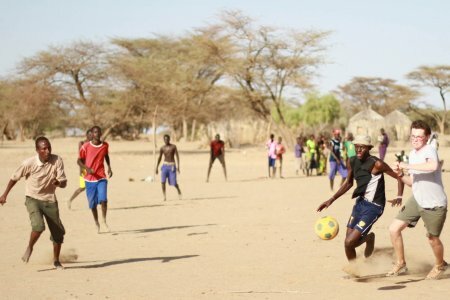 During their day off on Sunday, TBI Field School students traveled south to Turkana’s Nakwaparit elementary school for a friendly game of football (soccer in American English). 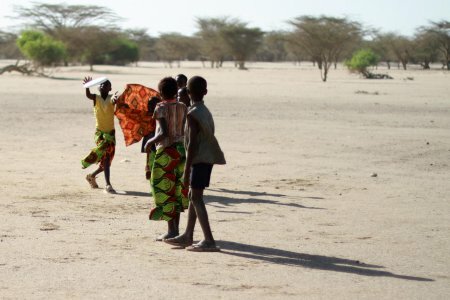 The Turkana name Nakwaparit describes the “flat white field” outside the school, used by students for informal football matches. Though Nakwaparit students were younger than TBI students, both teams were evenly matched, with neither side able to maneuver an advantage over the other until the very end. TBI Field School student Johnpius Mpangarusya vies with a Nakwaparit student for the football during our match on Sunday. 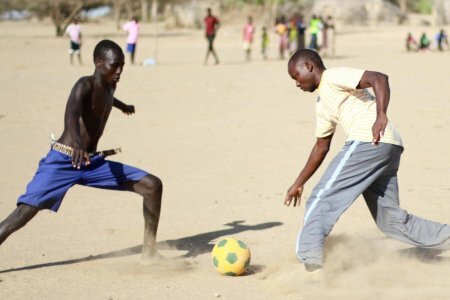 Turkana Basin Institute Field School students and staff made their way south of TBI to Nakwaparit elementary school Sunday afternoon for a football match on the school’s wide and sandy pitch. 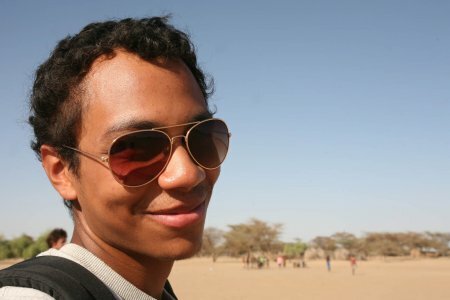 Most of the TBI participants were students from the United States or greater Kenya, though a number of local TBI staff also joined in on the fun, including Ikal Angelei, who organized the games. 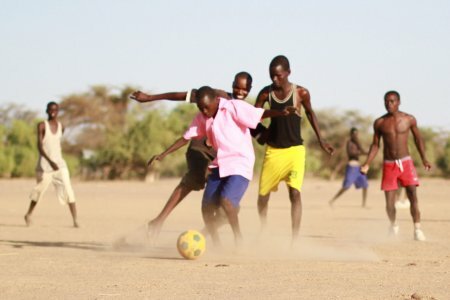 Nakwaparit students asked to play on one team, to demonstrate their abilities on the field. Most played barefoot, though the sand was hot enough at the outset of the match that the TBI team couldn’t. While many students participated in the match, others watched, or played hopscotch, frisbee, and other games on the sidelines. Quan and Alisha, center, look up with two Nakwaparit students as they wait for the ball to come within reach. John Mark and Ben race for the ball. John Mark, a member of the TBI staff and field assistant, came along to participate in the game. TBI students were elated until he surprised all by joining the Nakwaparit team! Debbie passes the ball. She acted as effective coach for the TBI team. Ben tries to win control of the ball from a Nakwaparit student. Luke demonstrates masterful ball control as he advances on the Nakwaparit goal box. 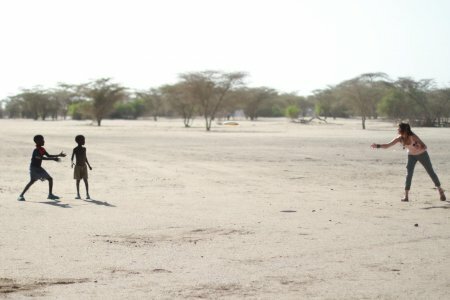 Luke Lomeiku is a native of Ileret, the famous fossil site critical to our understanding of human evolution, located on the east shore of Lake Turkana. During the match Luke acted as our most effective forward. Anacoli takes on four defenders at one time. Wyatt and John Mark both eye the ball towards the end of the match. Johnpius tries a move to pass a Nakwaparit defender on the left wing of the field. Alec, watching the match with other TBI and Nakwaparit studentes, smiles when the TBI team scores its third, and winning goal. Meadow Colden and Nakwaparit students make faces in the shade during the match. Meadow plays frisbee with Nakwaparit students. Bright cloth flutters in the sunlight as one student reaches to grab the frisbee. 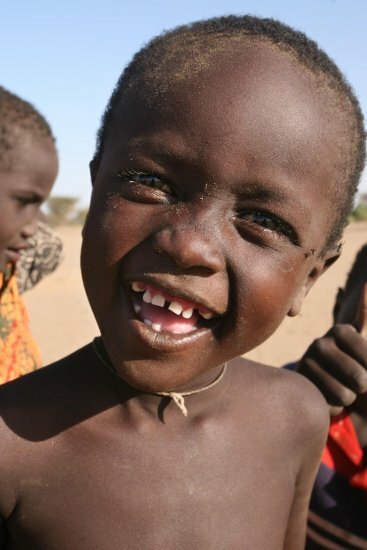 A Nakwaparit student smiles at the end of the day, before TBI Field School students return to main camp. The match was close, with the TBI team scoring the winning goal in the last 10 minutes of the second half, leaving a final score of 3-2. Nakwaparit students played in their bare feet, and against older students sometimes twice their side. Players from both teams had a great time, and have promised a rematch. The football match was fun and provided both communities a relaxing Sunday afternoon. More importantly, the games continued to strengthen the bonds between the TBI and greater Turkana community in the region. Photographs by Francis, Mandy, Priscilla, Alec and Meadow.